Inventing an alien language? Easy. Creating an entire writing system to go along with it? Now that's impressive. Here are thirteen alien alphabets (complete with downloadable fonts!) you should totally use to write your novel. As part of their truly gargantuan effort to make the 31st century a fully realized universe, series creators Matt Groening and David X. Cohen (well, mainly David X. Cohen) created Alienese, an alien alphabet that was primarily used to write humorous graffiti in the background of scenes. The alphabet has precisely the same twenty-six letters and base ten number system as English , and the writers didn't create an Alienese language to go along with the alphabet, so everything it said was in English (the main point of Alienese was to do in-jokes, after all). All of this allowed Futurama fans to decipher the alphabet within about thirty minutes of the show's premiere, forcing the writing staff to come up with a more fiendish challenge, which became Alienese II. Instead of the simple letter substitution of the first alphabet, this second alphabet uses a modular addition system, where the symbol to represent a given character changes based on the letter before it. Here's how it would work in English: say you want to write "Fry." First assign each letter of the alphabet the numerical value that is one less than their position in it, so A = 0 and Z = 25 (the reasons you have to do this are too complicated and boring to go into). You first choose the fifth letter, which of course is "F." For "R", the seventeenth letter, you combine the values of "F" and "R", which is 5 + 17 = 22, which means you use "W." With "Y", you add 24 to 22, which gives you 46. Since there are only 26 letters, you subtract 46 - 26 = 20, and so the final letter is "U". Thus "Fry" is spelled the equivalent of "Fwu" in Alienese II. Oh, and don't worry - none of the rest of these alphabets are even remotely this complicated. You can download the fonts here (although you'll have to do your own addition with Alienese II). You can also instantly convert between English and either language here. If you're still a bit confused about modular addition, you can check out a more detailed primer here. 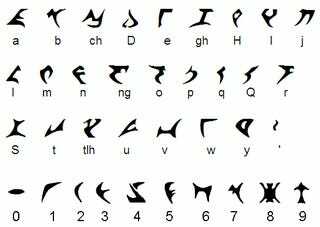 After the insanity of Alienese II, here's a nice straightforward alphabet used by the Ancients on Stargate. It's a fairly close phonetic match for the English alphabet, although "f" and "u" are represented by the same character, so there are only 25 letters total. Supposedly, the letters can take on new meanings when written upside-down. As far as numbers go, the Ancients actually used a Base 8 system, but they invented two additional numerals so that they could more easily deal with races that used a decimal system. There are no symbols for punctuation in the Ancient alphabet. The makers of Stargate were somewhat inconsistent in how they used the alphabet, occasionally writing context-appropriate messages in English, but more often simply using the language for in-jokes. Download the alphabet here. And, because I'm trying to encourage this sort of thing, here is a link to the Gospel of Matthew transliterated into the Ancient alphabet. This Japanese science fiction trilogy, along with its sequel Banner of the Stars, dealt with the Abh, an interstellar but strongly feudal race that was originally bioengineered by a highly nationalist faction in far future Japan. They speak Baronh, a language based on ancient Japanese. Created as slaves, the Abh at first had no written language, but upon gaining their freedom created Ath, a relatively independent alphabet that nevertheless had some basis in Japanese kana scripts. You can get the font here. In the 30th century era of the Legion of Superheroes, Interlac is the common constructed language of the United Planets. Considering the hugely diverse backgrounds of the Legion and their penchant for fighting evil on faraway alien planets, a lingua franca like Interlac is a very real necessity. Although the language was first used in a 1969 issue of Adventure Comics, it wasn't until 1984 that Paul Levitz and Keith Giffen standardized the alphabet into the consistent set that it is today. Recently, the titles of the five JLA and JSA books that made up the Lightning Saga were written in Interlac. And, in a sign of great cosmic respect, the Guardians use Interlac to write the Book of Oa. Klingon is probably the most famous science fiction language. Developed by linguist Marc Okrand for the Star Trek movies, Klingon is officially written using our alphabet. However, Klingon ships often have markings on them that clearly look like letters, which has led Klingon enthusiasts to search for a proper Klingon alphabet. This came when an unidentified figure from Paramount used the letters seen on the show to make an alphabet, which he or she then sent to the Klingon Language Institute. This alphabet, known as pIqaD, does not have a set correspondence between its letters and the English alphabet equivalents. The Institute has proposed the mapping seen above, but official sources say this is incorrect. A more official, albeit more bizarre, Klingon alphabet was originally developed by the Astra Image Corporation for Star Trek: The Motion Picture. These were also later used for the Skybox trading cards made for The Next Generation. Although there are still 26 phonetic values, just like in English, there are now only ten letters, meaning various characters double, triple, and sometimes quadruple up in possible meanings. This of course means that many words, some with directly opposite meanings, will look identical. Nevertheless, this alphabet is the one most often used by Star Trek production teams when adding Klingon lettering. Finally, there is the so-called Klinzhai script, which comes from The U.S.S. Enterprise Officer's Manual, published in 1980. 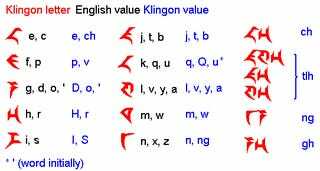 Based on concept art and other fragments seen in The Original Series, the alphabet has the major disadvantage of being formalized before Marc Okrand constructed the Klingon language, making it difficult to correlate with what is now "known" about the sounds of the Klingon language. Get the first pIqaD here along with several other Star Trek alphabets of varying degrees of officialness. Unfortunately, I can't find a font for the second pIqaD. You can download Klinzhai here. And, for the Star Trek fan who has everything except a Klingon keyboard, here is a Klingon keyboard. 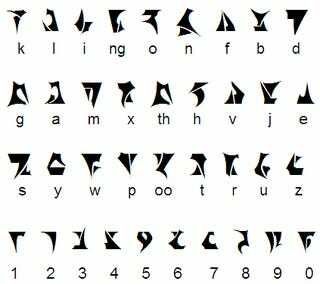 Kryptonese automatically gets points because it's the only writing system on this list that's a syllabary, not an alphabet. It grew out of several fan letters that attempted to rationalize the various squiggles used in the fifties and sixties to represent the language of Superman's destroyed home planet Krypton. Exasperated by the barrage of letters, DC editor E. Nelson Bridwell tried to end the unsolicited alphabets by explaining in one issue that Kryptonese actually had 118 letters. In a development that should stand as a lasting tribute to linguistic geekiness, Bridwell immediately started receiving proposals for 118-character Kryptonese alphabets. Bridwell, himself a lover of trivial minutiae, decided if the job was to be done, he really should be the one to do it, and set about combing through old comics to find 118 unique squiggles that he could designate as the various sounds of Kryptonese. Although this exercise was, of course, completely arbitrary, the end result was the massive syllabary you see above. Unfortunately, there are currently no fonts available online for Kryptonese, partially because its non-alphabetical nature would make it difficult for most keyboards. But here is a great site covering its history and mechanics. One of the many things removed from continuity by Johnny Bryne's Man of Steel reboot was Kryptonese. 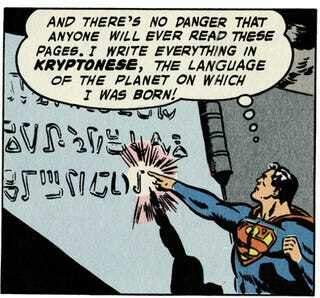 In its place came Kryptonian, which was a 26 letter alphabet that simply corresponded with the English alphabet. This new alphabet was introduced in 2000, and ever since any Kryptonian you might see in comics (the current World of New Krypton arc has a bunch of examples) are English phrases transliterated into Kryptonian. This also allowed the comics to finish the task of justifying why there's a big "S" on Superman's costume, as the Kryptonian "S" sort of looks like the Man of Tomorrow's symbol. (It's also a symbol of hope on Krypton.) And to think I had simply assumed the "S" just stood for Superman. Get the font here. You can also go here to check out a truly wondrous attempt to go beyond a simple letter substitution scheme and create a complete, linguistically consistent Kryptonian, complete with nine vowels and twenty-four consonants. The Mandalorians are best known as the warrior culture that trained Jango Fett and provided the inspiration for both the Fett family's armor and that of the Clone Troopers. In the Expanded Universe books, the Mandalorians have been developed as a fearsome third faction in the war between Jedi and Sith, sometimes following the Sith, but more often content to auction off their deadly services to the highest bidder. Karen Traviss, author of the Star Wars: Republic Commando series, is currently working on developing the Mandalorian language, Mando'a, into a fully functional language. The alphabet you see above comes from the Visual Dictionary companion to Attack of the Clones. Banks's series considers the Culture, a utopian society where various alien societies have been brought together in relative harmony under the benign governance of the Minds, a set of highly sophisticated AI. The Minds considered language a vital part of ensuring peace between species, and so they created Marain, a new language with no clear connections to any previously extant tongue. For the Marain alphabet, the Minds used binary as an inspiration, using a 3x3 grid of nine circles, with each circle either blackened or left blank. Lines were then drawn between the dots to construct the symbol, as can be seen in the chart above. Although there could theoretically be as many as 512 unique characters in the Marain alphabet, these 32 symbols in particular were chosen because then can be rotated and flipped without looking like any of the others, making all of them completely unique and distinguishable. Download the font here under the entry for December 21. For a more comprehensive explanation from Banks as to how the Marain writing system works, go here. This anime series from the early eighties concerned first contact between humans and the Zentradi, giant humanoids created eons ago by a mysterious protoculture to serve as their galactic warriors. The series's creators, Studio Nue, constructed a Zentradi alphabet for the TV series, which they then supplemented with a full-fledged Zentradi language for the followup movie.